Mrs. Murray's Ghost: A Piccadilly Street Story, Book 1 is a children’s adventure fantasy novel written by Emily-Jane Hills Orford. Mary was quite impressed with the rather magnificent house that she and her family were moving into. There was a tower three stories high, and her bedroom was immense and even had its own fireplace. Granted, London, Ontario was quite a bit farther from Toronto than her mom would have liked, and her big sister, who was in her last year of high school, was convinced she would never survive the horror of the relocation, but it seemed to suit the ten-year-old girl quite well. Everything about this old Victorian house promised adventure and mystery, and even the rumors about ghosts and bats seemed tantalizing rather than scary. The tenants who lived on the third floor confirmed that inexplicable noises and knocking sounds were all part of living there, but Mary was ready for anything. Emily-Jane Hills Orford’s coming of age fantasy for children and preteens, Mrs. Murray's Ghost: A Piccadilly Street Story, Book 1, will delight anyone who’s ever wondered how cool it would be to have a ghost in their house or wished there were secret passageways to discover behind the library wall. Mary is an intriguing character whose appreciation for her dolls doesn’t get at all in the way of her love of reading and penchant for adventure. Orford’s tale travels far afield into the realm of high fantasy when Mary becomes ill with a fever and finds herself on a quest with the grandest of companions. 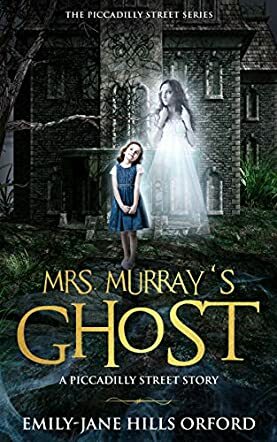 Mrs. Murray's Ghost: A Piccadilly Street Story, Book 1 takes the reader on that quest as well, reaching back into the mists of history and crossing continents as Mary comes to learn of her connection with the house’s ghostly presence. High fantasy fans of all ages should give this story a try. Mrs. Murray's Ghost: A Piccadilly Street Story, Book 1 is most highly recommended. When ten-year-old Mary Murray Barton's family makes the big move to a Victorian mansion near the intersection of Piccadilly and Waterloo Streets, the little girl is excited. She gets a large room with a fireplace and a new place to explore. Things, however, take a different turn when Mrs. Murray's ghost makes her presence felt by banging the kitchen cupboard doors and switching the kitchen lights on and off. The terrified Mary then meets the house's other residents, the friendly Brownies. One day, Mary is stricken ill and thus begins her journey to the other world. Mrs. Murray's Ghost: A Piccadilly Street Story Book 1 by Emily-Jane Hills Orford is a delightful fantasy sci-fi novel designed for young readers. Mrs. Murray's Ghost is the first in a series of Mary's forays into another world. The story unravels innocently enough in an old Victorian house until Mrs. Murray's ghost starts making mischief. Author Emily-Jane Hills Orford's creative writing style is highly descriptive and is told from the perspective of a ten-year-old girl. This may sound common enough but this ghost story, however, is quite unique because it is not written with the main purpose of scaring its readers. Instead, one gets a bit of history and a family tale that goes back many centuries to the time of the two English princes, murdered in the Tower of London, and the tragic life of Mary, Queen of Scots. In addition, this is a story of good and bad witches, a friendly ghost, and supernatural beings called the Brownies, and this is just the start of Mary's exciting adventures into a fascinating and scary world many of us have no idea exists.